Anyway, after the end of book one we join Matthew (swoon) and Diana in what’s one of my favourite periods of history, 1590, Tudor times. Its a dual purpose visit, they in danger from multiple sources and need an escape for a while, and also they’re hoping to find someone to teach Diana more about her magic. Back in history magic and witches were more prevalent, though still very dangerous and hidden from humans along with other creatures. They also wanted to see if they can trace the elusive book while its still whole. Its a riveting read, peopled with fascinating characters, some real and some dreamed up to fit the story. Matthew and Diana encounter new dangers, find out more – much more – about Diana’s amazing magics, and as warned by Daemon Hamish Matthew isn’t exactly the person Diana knows from 21st century. Back in these times he’s many roles from poet, spy, Knight of Lazarus, diplomat and member of the infamous School of Night. Diana finds all his many, many secrets difficult to accept, and he finds his jealousy of anyone in contact with her makes it hard to accept her having the freedom she’s used to. It isn’t just the danger of the times he’s protective about, but the real almost paranoia a vampire has for his mate. It means they have some hard arguments, and need to know and accept each other and that things won’t always run smoothly. Diana and Matthew’s journey takes them to Elizabethan England where she meets the sour tempered Queen ( I love it when Matthew calls her Lizzie in one encounter), more Creatures, some of whom help and others where they have to tread a careful line. The dangers and search for the book take them to Sept Tours, where Diana is amazed to see the castle in its historic state, and to Prague where the emperor wants to acquire Diana for himself. As you can guess Matthew isn’t pleased about that! 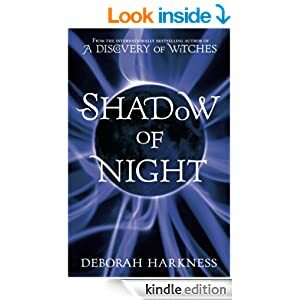 The characters we meet in this book are a huge mixed bunch, but all feel so real, and I was entranced at the attention to detail, from the alchemical experiments, the clothing and food of the times, and how they needed to let their close friends in on their secret, as despite their hopes they stood out as different to those who know Matthew well. I can’t tell you how much I love this series, how detailed it is without the reader being overloaded in stats and minutiae, it’s just a read that’s so hard to put down. Its so complex though that I found reading it over three days worked best for me. I wanted to race through – but its not that sort of book, and if I had I’d have missed so much. Of course having read it before helped me to pace myself, and I found so much I’d missed on first read. Like the first book its one I could read a dozen times and still not be bored. I’m so looking forward to the final part out this summer 🙂 and yet I’ll be sad to end the journey I’ve taken with them. I’m reading another series ( Allie’s war JC Andrijeski ) currently, and like this book that also has an incredible story, with so much detail I just wonder how on earth the authors come up with such amazing tales, and how they keep track of everything…I’m in awe of that talent they have, but as a reader I’m so pleased they decided to be novelists. These books are the sort I wish I could have a something extra in the rating – they are five star worthy of course but really deserve more than that. Stars: Five, massive five and wish there was a higher rating.